Madrid's traditional medieval carnival was revived in 1976 after being squashed for 40 years under Franco's regime. Revellers now exult in this plethora of partying and parades every year, with the action centred in venues like the Casino and the Circulo de Bellas Artes. Carnaval opens with a huge parade along the Paseo de la Castellana, and there are fancy dress competitions and an evening concert in the Plaza Mayor. The end of Carnaval, on Ash Wednesday, brings on the bizarre traditional 'Burial of the Sardine' parade, with the participants all dressed in black carrying a cardboard sardine in a coffin to be mournfully buried at the Fuente de los Pajaritos. This strange tradition is apparently symbolic of burying the past and starting anew. 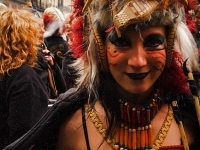 Although those is search of sin will find raucous parties aplenty, many of the events at Madrid's Carnival are family-friendly and those travelling with kids will be able to enjoy lots of innocent fun. Dressing up and donning a mask is recommended - the anonymity can be liberating, and being in costume naturally draws one into the celebrations. For more information contact the Madrid Tourist Office on 91 588 1636 or 91 366 5477.